Zara is a global fashion brand with widespread appeal. Best known for its trendsetting designs, Zara offers a broad range of casual styles for any occasion. With Big Apple Buddy’s personal shopping service, you can now buy the latest pieces from the USA Zara online store anytime, anywhere. Zara features a near limitless collection of Outwear Styles, including belted waistcoats, textured breast coats, suede trench coats, ruffled coats and more! You can buy coat for in almost any style or color imaginable! In the Jumpsuit Collection, there is an array of one-pieces suited for any occasion, including casual rompers for the beach to classy jumpsuit dresses for a night out. The opportunities are endless with ZARA’s immense fashion catalog. Zara’s dress collection combines elegant and chic styles with a broad range of pastel colors. The Crossover Front dress has a flow unlike any other. Its elaborate layered design contrasts shades of off-white to create a beautiful angelic look. For a more summery fun style, the Long Printed dress pops with bright colors and creative patterns, ranging from flowers to stripes to polka dots. Looking for the perfect top to complement your jeans, skirts or leggings? Zara’s tops aim for comfort and elegance. The silky texture and V-necks found in many Zara styles allow for casual yet classy looks. 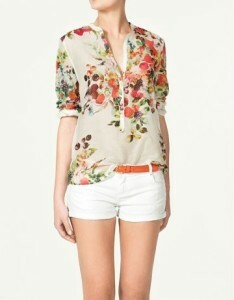 Their blouses break out from the solid colored tops and introduce floral designs and vibrant colors. At Zara, you can also shop from a vast collection of skirts. Craft your own unique look with a mini denim skirt or a long tube skirt. Other fashionable skirts on offer include A-line skirts, printed skirts, and elastic waist skirts. Zara stores are located worldwide, however the USA Zara online store stocks exclusive pieces that cannot be found anywhere else in the world. The USA Zara online store unfortunately does not offer international shipping. Not to worry though! Big Apple Buddy, your personal shopper, can help you buy products from the USA Zara online store and ship them to your doorstep, no matter where you are in the world. If you would like to buy from the USA Zara online store, simply let us know which items you would like to order (by filling out the form below) and we’ll get back to you with a free international shipping quote within 24 hours!